FIFA 19 is released at the end of the month and Pompey’s player ratings for the game have been revealed. Members of the Fratton faithful will be itching to get their hands on the latest version when it goes on sale on September 28 and start a career mode with the Blues. Every member of Kenny Jackett's first-team squad is included. And it comes as no surprise that Brett Pitman is Pompey's best-ranked player. The striker has been given a rating of 69 – the same as last year. However, that score leaves the former AFC Bournemouth man outside the top-10-ranked players in League One. According to the boffins at EA Sports, Pitman is the joint-14th best player in the division. Unsurprisingly, Sunderland players occupy the top four – although top-rated Ibrahim Ndong (74) is yet to play this season, while third-placed Papy Djilobodji (72) had his contract at the Stadium of Light terminated yesterday. Meanwhile, the likes of former Blues centre-back Jason Pearce (71), Plymouth forward Graham Carey (70) and Marcus Maddison (70) – whose Peterborough side host Pompey on Saturday – all come in higher than Pitman. Level on a rating of 69 with the Blues skipper are players such as Ricky Holmes (Oxford), Jason Holt (Fleetwood) and Daniel Pinillos (Barnsley). 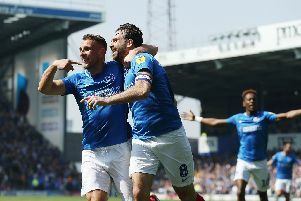 Pitman is ranked as Pompey’s best player on the game – despite finding himself out of Jackett's starting line-up this season. The 30-year-old has made just one League One start and has fallen behind Oli Hawkins in the striking pecking order. However, the ex-Dagenham & Redbridge marksman has only been handed a score of 64 by the game-makers. There are three players rated just one point behind Pitman and there won’t be too many complaints. Matt Clarke, Jamal Lowe and Aston Villa loanee Andre Green have all been given scores of 68. One who may feel aggrieved with his rating, though, is Ronan Curtis. The forward has made a barnstorming start to his Pompey career since arriving from Derry City in the summer, registering five goals and three assists. However, Curtis has only been given a rating of 64.